AMR Research indicates that more than 60 percent of the top 50 enterprise software vendors have applications that rely on Java. Larry Dignan asks: Anyone out there still think Oracle's acquisition of Sun was about hardware? AMR Research has recapped its annual ranking of the top 50 enterprise software vendors, but the real story may be in its findings that more than 60 percent of the top dogs have applications that rely on Java. And of the top 50 enterprise software vendors 33 offer applications that rely on Java. Add it up and this group represents more than $38.5 billion, or 77 percent of the top 50's revenue. Anyone out there still think Oracle's acquisition of Sun was about hardware? Simply put, Oracle through Java has its hand in most of the enterprise application market. AMR reckons that these Java-reliant vendors will have to reevaluate their commitment to Java. That's putting it mildly. 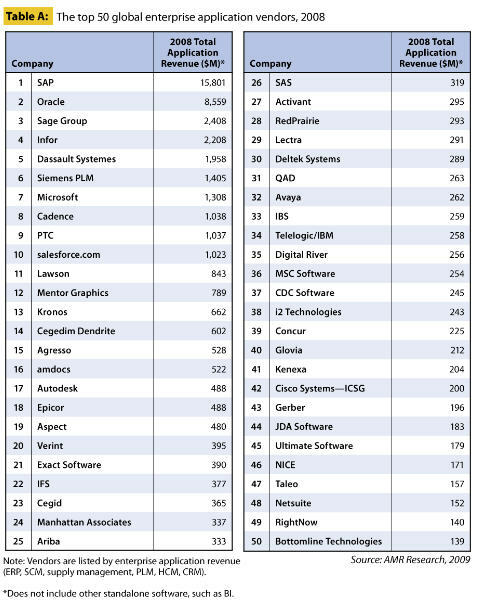 Here's a look at the top 50 enterprise application vendors by revenue. Also see: Can Oracle give Java a boost (and monetize it better)?